I am surprised how frequently the questions I am asked centre around one object of clothing: brown shoes. This is because men’s certainty about the alternative (black shoes) creates a spectrum of worries as to how, when and where they should be worn. First, forget all that ‘never brown in town’ rubbish. Do you wear a dark suit to work everyday (usually a three-piece), keep the jacket on throughout and always pair it with a sober tie? Then you’re breaking far more recent rules than the brown/town one – which was established when brown was a sure sign that a man was loping off to his country estate after work. Modern business attire is far more flexible. Understand the spirit of archaic rules, rather than blindly following the letter. Second, black shoes are an English thing. Yes they mean business everywhere, but other countries (Italy, US) accepted the benefits of brown leather years ago. You wear an Armani suit and a Ralph Lauren shirt. Why stick obstinately to an English tradition? So, what to wear them with? Navy and mid-grey are my favourites. Avoid lighter blues and darker greys (charcoal). There is no particular rationale for this, but those tones benefit in particular from having a colour in the shoe they are worn with. Black is not a colour; it may serve to enrich the colour it is worn with, but it is not a colour itself. Those are some basic cloth suggestions. The important thing to remember is that the same guidelines on shoes elsewhere also apply to brown – indeed if anything they are more important there. 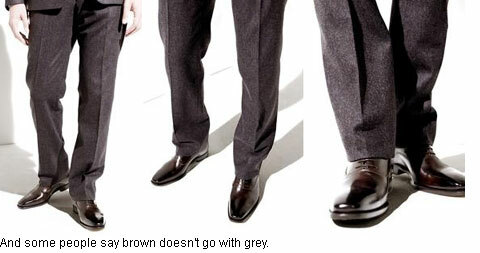 One is that your shoes should always be darker than your suit trousers. If tan shoes are being worn more casually, there is some leeway there. But don’t wear tan shoes with a navy suit. Try a chocolate brown instead and you’ll realise what the Italians are going on about – why they embolden each other. A second guideline to bear in mind is that brown shoes are still not as smart as black. Yes, they are accepted; but no, they are not a replacement. If you’re in doubt about what to wear to a meeting, wear black. If you’re in doubt what to wear with odd trousers, wear brown. Use your judgement and aesthetic nouse for everything in between. Some people still dislike brown shoes for being inelegant. Part of the reason I like them so much is probably the greater possibilities for patina and polish. Whatever your reason, think through their use logically using these guidelines and you can’t go wrong. Shouldn’t that read “forget all that ‘never brown in town’ rubbish”? Otherwise – I agree wholeheartedly with everything. I hoped that my work colleague who wore black trousers & tan shoes had got dressed in the dark or something, but now he’s a repeat offender in this regard so he — the horror — must mean it. Sheesh. How about a cognac brown with a darker blue suit? Or is that too much?